Alan M. Jaffe, Psy. D. and Associates (Chicago) - Book Appointment Online! Licensed Clinical Psychologists working with Psychiatrists, Social Workers and other allied mental health professionals to provide Multidisciplinary approach to diagnostic assessment, treatment and consultation. 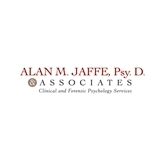 Dr.Alan M. Jaffe is on the faculty at Northwestern University Feinberg School of Medicine and supervises interns and externs at three Professional schools of Psychology in Chicago. We bring many years of expertise to several areas of clinical and forensic practice. Our forensic work often includes consultations in divorce or child custody hearings. We have worked along side divorce attorneys and have years of experience with the courts acting as an expert witness. He helped me tremendously! The first session was my first therapy session and I am very happy I called him. I made another appointment for next week.